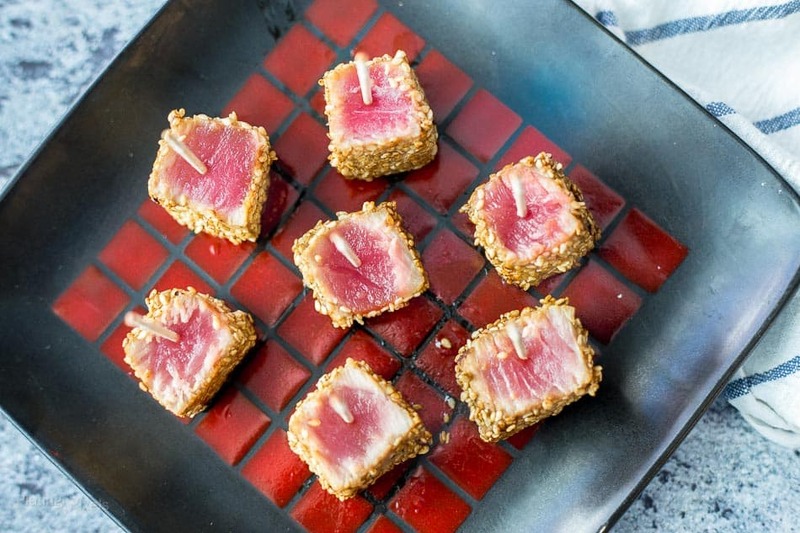 Sesame Seared Ahi Tuna Bites are a fresh and healthy appetizer. Marinated in soy sauce, sesame oil and ginger, coated in sesame seeds and seared. With a tender rare center, these will be a hit at your next gathering. Light, natural, fresh and colorful are some of my favorite food terms during spring. This time of year also means more outdoor activities, hosting and get-togethers. 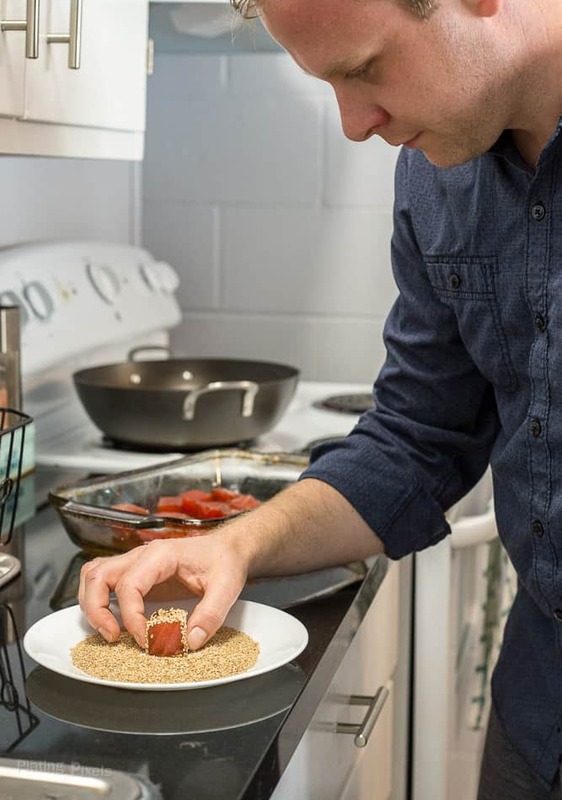 If you’re looking for a fresh and easy-to-share recipe then these Sesame Seared Ahi Tuna Bites will be hit. Start with fresh wild-caught ahi tuna. Look for sushi-grade and ask your fishmonger if it’s safe to consume raw or lightly cooked. The fresher the fish, the better the flavor, so be sure to find the best fish you can. Specialty and health food markets are best for this. Start with fresh, sushi quality ahi tuna. Wild-caught is best. Cut the tuna into chunks and lightly marinade in a mixture of soy sauce, sesame oil, rice vinegar, honey and ginger. About 10-15 minutes is enough to infuse the flavor in the light, tender tuna. For best presentation: coat 4 adjacent sides with sesame seeds, but leave the two opposite ends uncoated to keep meat exposed. Cook each sesame coated side until lightly browned, about 15-20 seconds per side. Centers should be pink and rare. Remove from pan and insert one toothpick into each. Serve with remaining sauce for dipping. Once the tuna has marinated a bit, generously coat them in sesame seeds before searing. Flavor profiles: Fresh and mild tuna, with savory umami sesame soy sauce glaze. Texture: Tender, rare sushi-grade tuna with a bit of crunch from sesame seeds. Ahi tuna marinated in soy sauce, sesame oil and ginger, coated in sesame seeds and seared. Served with rare center. Cut tuna into square pieces, about 1-inch size, set aside. In a large bowl stir together first five ingredients through ginger until combined. Remove half of sauce and set aside. Stir tuna pieces into large bowl to coat, let sit 5-10 minutes. Evenly spread sesame seeds onto a plate or flat surface. Coat each piece of tuna with seeds. For best presentation, coat 4 adjacent sides, but leave the two opposite ends uncoated to keep meat exposed. Heat olive oil in a large non-stick pan to medium high heat. Add prepared tuna pieces and cook each sesame coated side until lightly browned, about 15-20 seconds per side. Center should be pink and rare. Remove from pan and insert one toothpick into each. Serve with remaining sauce for dipping. 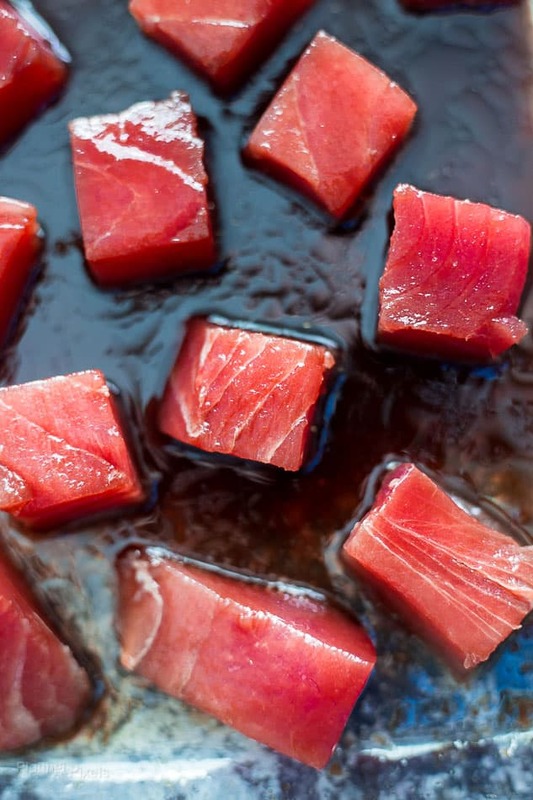 WOW, does this ever look like the best ahi tune bites ever! I love the marinade and pairing it with Prosecco sound right up my alley! These ahi tuna bites are so adorable! Perfect party pleaser. 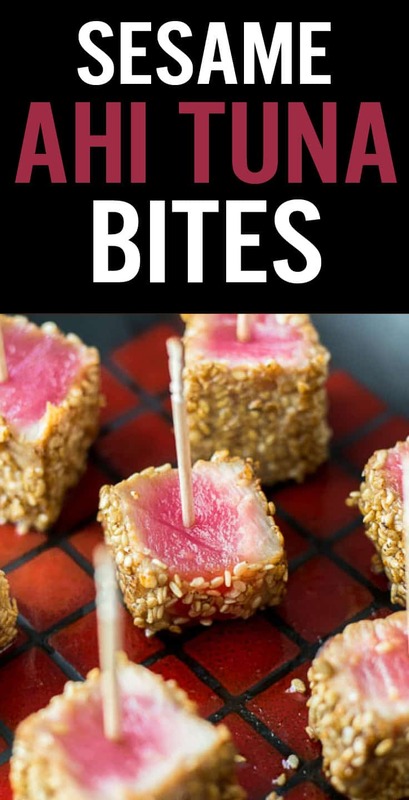 I have never thought of turning seared ahi into bites. This is a great entertaining idea and I have to try this. Ahi tuna is one of the most beautiful foods, and this is such an adorable way to enjoy it, thanks! Hi Matt, I really like this recipe. I can use it for salads too. Thank you! !